U.S. Transfers 5 Guantanamo Detainees To The United Arab Emirates : The Two-Way Four of the detainees had been cleared for transfer since January 2010; the other was approved last year, the Pentagon said Sunday night. 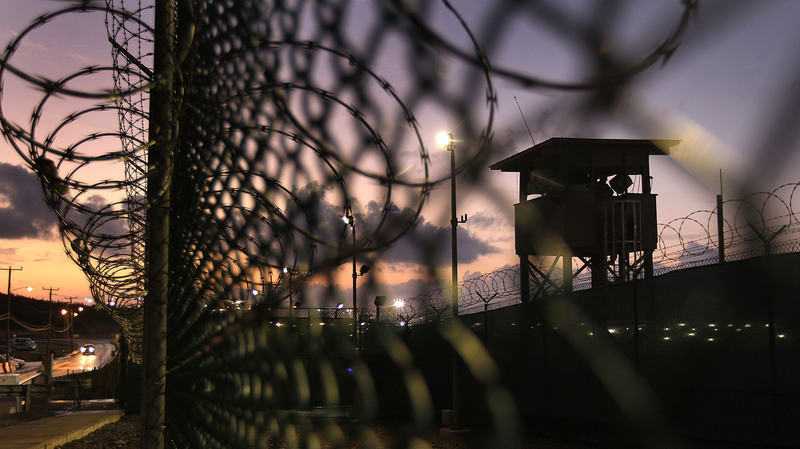 The transfer leaves 107 detainees at Guantanamo. A guard tower stands at the perimeter of Camp Delta in the Guantanamo Bay detention center on March 30, 2010. On Sunday, the Pentagon announced five Yemeni detainees had been transferred to the United Arab Emirates. The U.S. has transferred five detainees from Guantanamo Bay to the United Arab Emirates, the Defense Department says. The transfers are part of the years-long effort to close the military prison. Now, 107 detainees remain at the facility, the Pentagon says. Forty-eight of them have been recommended for transfer. President Obama has repeatedly pledged to close Guantanamo Bay before he leaves office. But he was dealt another setback last week, when Congress once again sent him a defense bill blocking the transfer of Guantanamo detainees to the United States. Four of the newly transferred detainees have been cleared for transfer for more than five years. Three of them — Adil al-Busayss, Khalid al-Qadasi and Suleiman al-Nahdi — had been approved for transfer during the Bush administration, the Miami Herald reports. The fourth detainee, Fahmi al Asani, was approved by the Guantanamo Review Task Force in January 2010. The fifth, Ali al-Rahizi, was recommended for transfer more recently. The Periodic Review Board (similar to a parole board) considered his case last year, and found no "continuing significant threat to the security of the United States" that would require his detention. All five men are Yemeni. Each had been held for more than 13 years, the Associated Press reports, and had not been charged with a crime. The U.S. stopped transferring Guantanamo detainees to Yemen in 2009, deterred by deep concerns over security issues — and determining where else to send them has been a major obstacle to closing the facility. The U.S. has sought other countries, including Oman, Kazakhstan and Slovakia, willing to take them in. This is the first time the UAE has accepted Guantanamo detainees from Yemen, and the Pentagon expressed gratitude for the Emirates' "willingness to support" U.S. efforts to close the military prison. Sixty-four Yemenis remain at Guantanamo, The Washington Post reports, with 39 approved for transfer or release.